September 28, 2016 — Bestbuy Distributors Limited annual Buy & Sell attracted shareholders from across Canada to meet and network with valued suppliers from all over North America for a celebrated Canadian conference in the alpine paradise of Whistler, September 18 – 21, 2016. The event, which combines supplier meetings with several social events, attracted the majority of the buying group’s shareholders as well as a wide variety of suppliers to the impressive Fairmont Chateau Whistler resort; located at the base of beautiful Blackcomb Mountain. 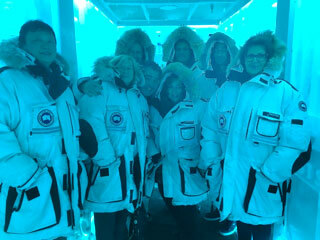 Vodka tasting in the famous “ice room” of the Bearfoot Bistro in Whistler. Two days of successful meetings with suppliers were highlighted with events such as a Welcome Reception, the annual SickKids golf tournament and SickKids day tour, as well as a spectacular dinner party at the Squamish Lil’wat Cultural Centre in Whistler. The magnificent Chateau Whistler Golf Course was host to Bestbuy’s popular annual SickKids golf tournament. Non-golfers participated in the SickKids Day tour which took the group on a guided tasting adventure through Whistler Village. Both groups and both events raised over $20,000.00 for the world-renowned Family Heart Centre at Toronto’s Hospital for Sick Children through raffle sales and golf sponsorship. To-date, Bestbuy shareholders and valued suppliers have raised over $775,000.00 for the leading children’s medical facility. This year’s proceeds from the golf tournament, day tour and raffles will be pooled and a cheque presented to the Hospital for Sick Children at Bestbuy’s upcoming 2017 Annual General Meeting in February in Toronto. For more information, please contact Karen Barkin.